out to 1.8 billion light-years. Credit: M. White, University of California, Berkeley. In the gravitational model of the universe, "dark matter" attraction pulls galaxies into filaments. Birkeland currents could be a better explanation. A recent announcement in the astronomical journals and popular press identifies an area of space as a "huge hole" completely empty of matter and energy. The hole isn't really a hole, it is an area of space where the temperature of the Cosmic Microwave Background (CMB) is lower than the surrounding region. Arno Penzias and Robert Wilson inadvertently discovered the CMB in 1965 in the now fabled experiment where they detected noise in the signal coming from a radio receiver they were building. After cleaning out pigeon nests from the horn of the radio receiver and rewiring the system from top-to-bottom, the noise persisted. Finally, after weeks of investigation into the cause, the noise was identified as coming from every region of the sky and not from their receiver. 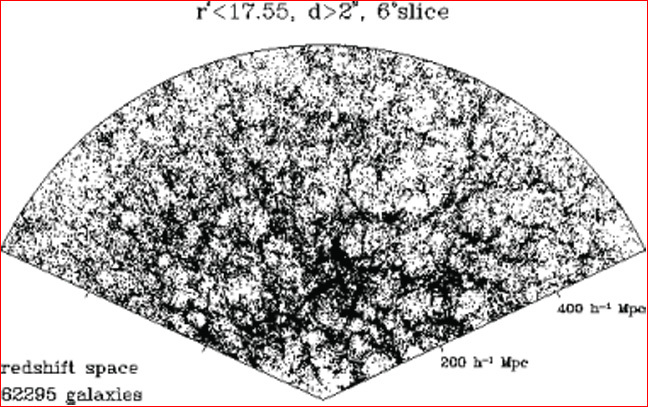 The "noise" was later to be called the "remnant signal from the beginning of the universe" because it appeared to be radiating uniformly at a microwave frequency corresponding to a temperature of 2.7 degrees above absolute zero (-270.45 degrees centigrade). Since the expanding universe theory had been popularized by Gamow in 1948 as an initial zero-point energy field inflating into the space-time that we experience today, the electromagnetic energy created in that event should have cooled and dimmed over the billions of years since it came into being. The discovery by Penzias and Wilson confirmed the hypothesis (as well as several other competing hypotheses). Now, after analyzing data from the Very Large Array radio telescope in New Mexico, a drop in temperature has been detected. According to the "redshift-equals-distance" theory, the "void" extends for almost a billion light-years. "Although our surprising results need independent confirmation, the slightly colder temperature of the CMB in this region appears to be caused by a huge hole devoid of nearly all matter roughly 6 to 10 billion light-years from Earth," Rudnick said. The Wilkinson Microwave Anisotropy Probe (WMAP) was launched June 30, 2001, from Cape Canaveral in an attempt at understanding some unusual telemetry returned by the Cosmic Background Explorer (COBE) satellite in 1992. Temperature fluctuations appeared in the data, which seemed to mission specialists as if there were regions of lower mass density in the universe. Since the Big Bang theory did not account for such areas of anisotropy - matter and energy should be evenly distributed - an instrument was manufactured with higher resolution detectors. The WMAP survey verified COBE's results. The Electric Universe (EU) theory has an entirely different way of addressing these matters. It does not rely on unseen and undetectable matter whose existence can only be inferred. It does not violate its own gravitational cosmology by inventing an anti-gravity force so that galactic acceleration can be explained. Instead, EU theory states that what we see in the universe is what we get. 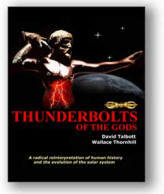 The electric currents flowing through ionized gas and dust provide the energy for the stars and present themselves in straightforward and understandable ways without resorting to arcane sophistry. "If Arp and others are right and the Big Bang is dead, what does the Cosmic Microwave Background signify? The simplest answer, from the highly successful field of plasma cosmology, is that it represents the natural microwave radiation from electric current filaments in interstellar plasma local to the Sun. Radio astronomers have mapped the interstellar hydrogen filaments by using longer wavelength receivers. The dense thicket formed by those filaments produces a perfect fog of microwave radiation - as if we were located inside a microwave oven. Instead of the Cosmic Microwave Background, it is the Interstellar Microwave Background. That makes sense of the fact that the CMB is too smooth to account for the lumpiness of galaxies and galactic clusters in the universe." So, in reality, there is no temperature fluctuation from the earliest days of the universe. There is no CMB and there is no anti-gravity accelerating matter in the distant cosmos to almost the speed of light. Birkeland currents flowing through plasma in mega-parsec filaments ignite the stars and form spinning galactic pinwheels as far out as our instruments can see.